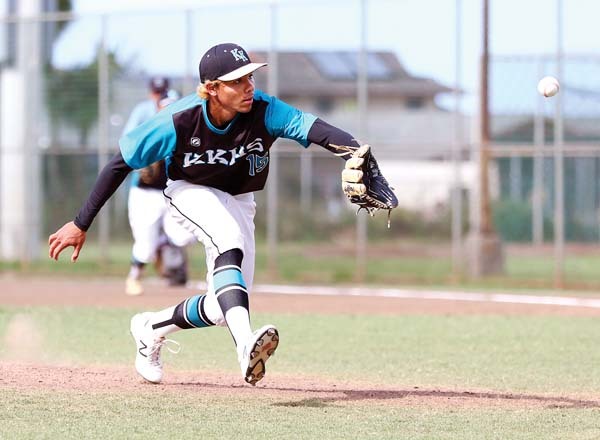 Michael Beesing tossed a complete-game nine-hitter to lead the King Kekaulike High School baseball team to its second straight win, 4-3 over Lahainaluna on Friday at Maehara Stadium in Wailuku. Beesing struck out five and walked three for Na Alii (2-6). Keanu Pakele was 2-for-3 with an RBI, while Jaxon Holl scored after hitting a double. Kamahao Acpal went the distance on the mound for the Lunas (0-8), allowing six hits, striking out five and walking two. Ekolu Mathias was 3-for-3 with a run, and Mason Arruda was 2-for-3 with an RBI for Lahainaluna, which committed seven errors. The Warriors evened things up in their series and in the standings with the Sabers –both teams are 4-1 and 1 1/2 games behind idle Baldwin in the MIL regular-season race. Cyrus Robson, Graydon Tanaka and Iokepa Supnet combined on a two-hitter for Kamehameha, which had five players collect at least two hits. Tristan Catan led the Warriors’ 13-hit attack with a 3-for-3 day that included three runs, an RBI and a triple. Kamahao Acpal and Koapaka Purdy. Michael Beesing and Koa Hashimoto. 2B–King Kekaulike: Jaxon Holl. 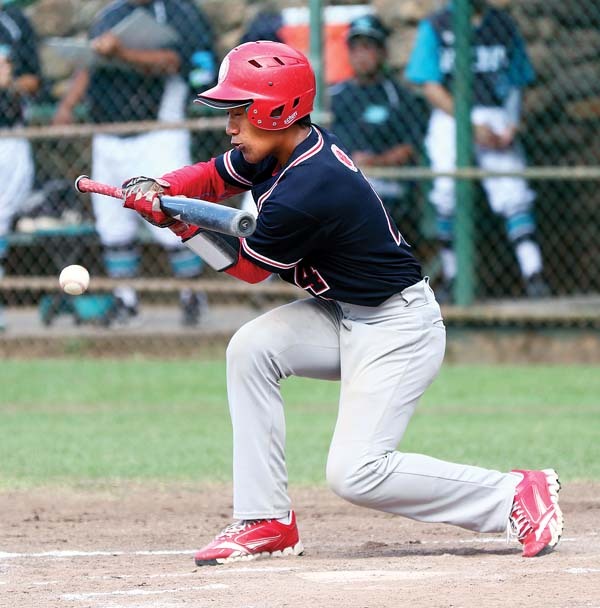 Leading hitters–Lahainaluna: Ekolu Mathias 3-3, run; Mason Arruda 2-3, RBI. King Kekaulike: Keanu Pakele 2-3, RBI. Cyrus Robson, Graydon Tanaka (6), Iokepa Supnet (7) and Ross Panlasigui. Rayven Ruiz, Nainoa Garso (7) and Hauoli Caliva. W–Robson. L–Ruiz. 2B–Kamehameha Maui: Konner Palmeira, Jarrin Correa. 3B–Kamehameha Maui: Tristan Catan. 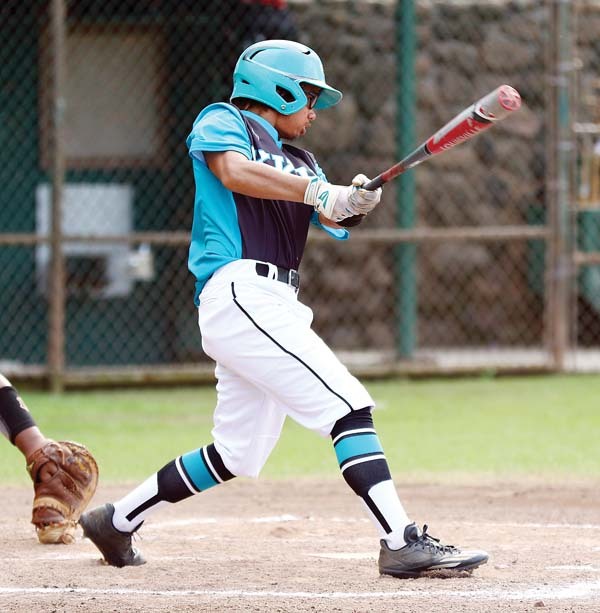 Leading hitters–Kamehameha Maui: Palmeira 2-3, run, 2 RBIs; Catan 3-3, 3 runs, RBI; Nate Facuri 2-2; Correa 2-4, run; Lopaka Cabanilla-Aricayos 2-5, run, RBI. St. Anthony vs. Seabury Hall at Maehara Stadium, 1:30 p.m.
Lahainaluna vs. King Kekaulike at Maehara Stadium, 3:30 p.m.
Kamehameha Maui vs. Maui High at Maehara Stadium, 5:30 p.m.